I’m never sure about these blog type things. I’ve had one in the past, but I always felt like it was this super-hubristic thing. I mean, really: why would people want to read about me and my life? I’m mostly starting this blog because I want to be involved in the French Fridays with Dorie group. You don’t need a blog to be a member, but why not just go whole hog? Eh, I’ll add to the blogosphere noise, and who knows? Maybe some little tip that I’ve learned along the way will help someone. Not to say they couldn’t find that tip on someone else’s blog, but there it is. I should add that I also like French food, and while I don’t categorize myself as a francophile, per se, my scholarly research is heavily based in French stuff. And I’ve spent a good deal of time in France. I’ve had crappy food there and I’ve had really good food there. I cooked both crappy and really good food there. What can I say? Living in a tiny apartment in the 6ème (close to the Pont Neuf!) doesn’t afford a lot of opportunities for massive cooking. Crap, I had to buy a collander when I moved in so I could make pasta! Anyway, enough of that. Suffice it to say that DG’s cookbook was attractive to me on many levels. I purchased the Around My French Table cookbook just after Christmas. I’ve also got DG’s book with Julia Child, and as you can see in my profile, I align myself more with being a really good baker over being a good cook. I started cooking dishes from the book because they all sound so good. 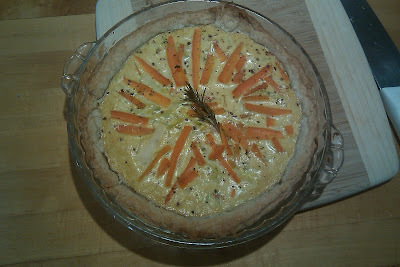 Lo and behold, they vary, taste-wise, from pretty darned good to “wow!” Example: the orange-almond tart I made last week. It was the closest thing I’ve ever made to the pastries I’d buy while I lived in Paris. It was lovely. This, people, is a cookbook worth purchasing, at least if you like this kind of food. Today, I have a lot of work to do. No. Not just today. The entire weekend I have a lot of work to do. So, clearly I need to cook. And it was lunchtime! 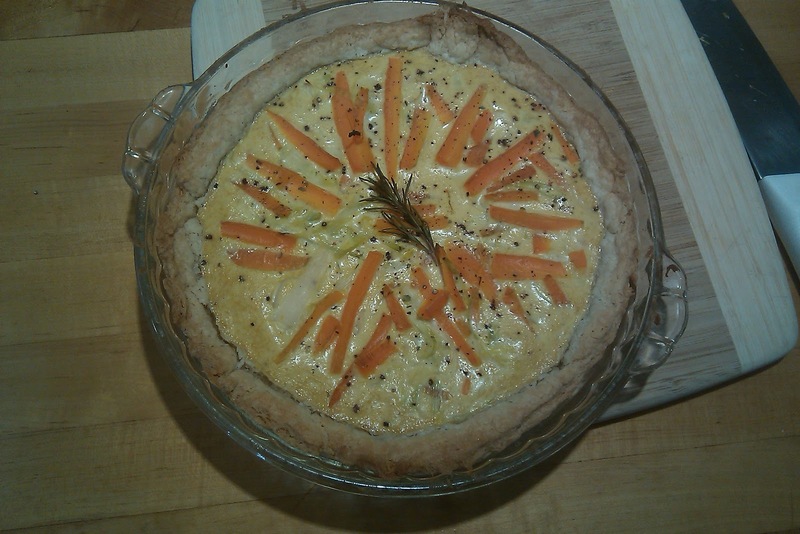 I checked the fridge for ingredients and flipped through The Book and found…Gérard’s Mustard Tart! Thankfully, pastry is not something I’m overly scared of. I quickly made the pie pastry from Thomas Keller’s Ad Hoc at Home because it was the ONLY recipe I have that doesn’t require that godawful shortening stuff. Chilled the dough for an hour while getting the other ingredients ready for the tart. I only had the moutarde à l’anciènne (basically, whole grain mustard) so I put the massive 4 tbl of that into the egg/crème fraîche mixture. Slipped it all in a 9.5-inch pie pan and voilà! Lunch! I served it warm, letting it rest for about 15 minutes out of the oven, and had a nice glass of white wine–a Cal-Ital blend of Tocai Friulano, Arneis, and Traminer–that had the acidity, minerality, and fruit to stand up to the mustard while still being ever-so-light. I should note, too, that the mustard flavor was just the right amount of kick, and nowhere near as overwhelming as one may fear upon looking at the recipe. Seriously, the best lunch I’ve had in a long time! Add a little salad, like DG recommends, and it won’t feel quite so decadent. The “pie” photo above was taken with my phone only seconds after removing it from the oven.